Paul Scott, of Raleigh, NC, won the singles title at the 2009 US Croquet Association National Championships, held November 8–14 at the Mission Hills Country Club in Rancho Mirage, California. With his previous wins in 2001 and 2007, Scott becomes the fifth player to win the American-rules national singles title three or more times, joining Archie Peck (1977, 1979, 1980, 1982), Jeff Soo (2000, 2002, 2005, 2008), Reid Fleming (1986, 1988, 1992), and John Osborn (1987, 1991, 1999). Playing, as usual, with scarcely any preparation for the tournament, Scott had his normal slow start. He managed to finish second in his block, but with an unimpressive 6/9 record. Meanwhile he and Soo, partnering in doubles as usual, had their worst-ever performance, winning just two of six block games and failing to qualify for the playoffs. Once in the singles playoffs, Scott barely avoided an immediate descent to the losers bracket, coming back from near death against Jim Houser to win 26-24. He followed that game with clinical wins against Steve Scalpone and Soo to reach the winners bracket final against fellow North Carolinian Danny Huneycutt. 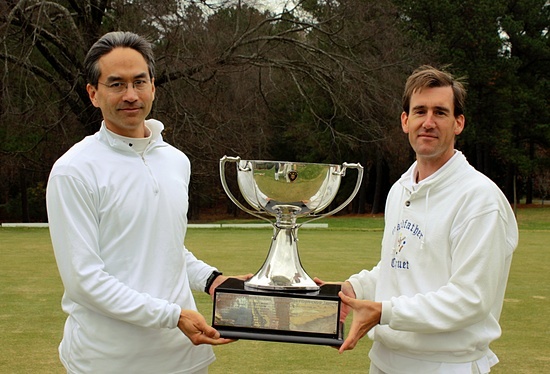 Huneycutt, the 2005 US national champion of Association Croquet, won 26-4 to reach his first American-rules national singles final. Scott fought his way back to the final by beating Rich Lamm, 26-10, and top seed Ben Rothman, 26-3. The latter game featured an entertaining opening, starting with two out-balls battling at 1. When Rothman scored 1 with black from the boundary while Scott’s red was in position at 2 and Rothman’s blue in position at 3, Rothman looked to be one hit-in away from a rare 26-1 win. But his shot drifted right, ending on the north boundary. Scott then scored 1 with yellow from long and angled position. His shot at red also missed, ending about halfway between 2 and the north boundary. Rothman’s half-court shot with blue at red missed, and Scott scored 2 nearly to the north boundary, nudging black and leaving him with a rush toward corner II. This gave just enough extra distance to make his challenging break-building play a little easier, and from there he played two tightly-controlled breaks for the win. The opening of the final was similar, with a brief spell of out-play that started when Huneycutt took his accustomed position at 1 with red, about five feet back and angled toward corner I, and Scott failed 1 with black. Huneycutt jumped through with yellow and set at 2, then Scott shot blue at yellow and missed to near corner II. Huneycutt then wowed the crowd by jumping through 1 with red, playing the shot so cleanly that red went out of bounds after scoring the hoop. With black in angled position at 1, Scott simply adjusted. Huneycutt scored 2 with yellow, pausing to consider an attempt at roqueting one of the boundary balls, before finessing to corner III. Scott played blue on court about halfway between 1 and 2, attempting but failing to hide from red. Huneycutt took the shot with red, his mallet catching the boundary string just before impact, slowing the shot just enough to prevent red from reaching the west boundary. Scott scored 1 with black and played a delicate roquet on red, then continued to the peg, not touching yellow and attempting to wire all three balls from it with his leave. He got two of the balls at least partially wired, but left an open shot on black, a couple of yards in-court. Huneycutt missed this 30-yard shot and Scott finished 26-3. Including doubles, Scott’s third singles title is also his seventh American-rules national title and eleventh overall national title, putting him within one of record-holder Soo in each category. It also extends Scott and Soo’s streak in which one or the other of them has won the singles title each of the last seven times they have entered this tournament.